Amyloid is deposited in the walls of arteries and capillaries as cerebral amyloid angiopathy (CAA) in the brains of older individuals and of those with Alzheimer disease (AD). CAA in AD reflects an age-related failure of elimination of amyloid-beta (Aβ) from the brain along perivascular lymphatic drainage pathways. In the absence of conventional lymphatic vessel in the brain, interstitial fluid and solutes drain from the brain to cervical lymph nodes along narrow basement membranes in the walls of capillaries and arteries, a pathway that is largely separate from the cerebrospinal fluid. In this review we focus on the pathology and pathogenesis of CAA, its role in the aetiology of AD and its impact on immunotherapy for AD. The motive force for lymphatic drainage of the brain appears to be generated by arterial pulsations. Failure of elimination of Aβ along perivascular pathways coincides with a reduction in enzymic degradation of Aβ, reduced absorption of Aβ into the blood and age-related stiffening of artery walls that appears to reduce the motive force for lymphatic drainage. Reduced clearances of Aβ and CAA are associated with the accumulation of insoluble and soluble Aβs in the brain in AD and the probable loss of homeostasis of the neuronal environment due to retention of soluble metabolites within the brain. Tau metabolism may also be affected. Immunotherapy has been successful in removing insoluble plaques of Aβ from the brain in AD but with little effect on cognitive decline. One major problem is the increase in CAA in immunised patients that probably prevents the complete removal of Aβ from the brain. Increased knowledge of the physiology and structural and genetic aspects of the lymphatic drainage of Aβ from the brain will stimulate the development of therapeutic strategies for the prevention and treatment of AD. Deposition of amyloid-beta (Aβ) in the walls of cerebral arteries and capillaries as cerebral amyloid angiopathy (CAA) has a prevalence of 90% to 96% in patients with Alzheimer disease (AD)  and is present in 30% of non-demented individuals over the age of 60 years . CAA reflects an age-related failure of elimination of Aβ from the brain along perivascular lymphatic drainage pathways by which interstitial fluid (ISF) and solutes drain from the brain [3–5]. This failure may be a key factor in the aetiology of AD. Most organs have networks of lymphatic vessels that transport fluid, protein macromolecules, cells and particulate matter from tissue to lymph nodes. Lymphatic drainage along these vessels relies upon highly competent valves, an extrinsic pump action generated by external forces from surrounding tissues and an intrinsic pump generated by coordinated contractions of lymphatic muscle cells . There are no conventional lymphatics in the brain. Instead, ISF and solutes drain out of the brain along narrow basement membranes in the walls of capillaries and arteries to lymph nodes in the neck [3, 7], probably driven by an intrinsic pump powered by vascular pulsations . The perivascular lymphatic drainage pathway for ISF and solutes from the brain is largely separate from the cerebrospinal fluid (CSF) [7, 9]. With increasing age, the brain, with its almost unique lymphatic drainage system, develops problems with lymphatic drainage of Aβ and other amyloids and these problems are rarely seen in other organs. As a result, soluble and insoluble Aβs accumulate in vessel walls and in brain parenchyma. CAA in AD is a protein-elimination-failure arteriopathy (PEFA) [5, 7] common to other forms of CAA in which a variety of amyloidogenic peptides accumulate in the walls of cerebral arteries. Non-Aβ forms of CAA tend to be hereditary in origin and are associated with intracerebral haemorrhage or dementia . Mutated cystatin C is deposited in the walls of cerebral arteries as CAA and occasionally in arteries elsewhere in the body in the autosomal dominant hereditary cerebral haemorrhage with amyloidosis of Icelandic type (HCHWA-1) [10, 11]. Patients suffer intracerebral haemorrhage at an early age, and those who survive may develop dementia . Variant transthyretin accumulates in vessels in the endoneurium of peripheral nerves in familial amyloid peripheral neuropathy , and in some families, there is deposition of mutant transthyretin in the walls of leptomeningeal arteries and in brain parenchyma . In the Finnish type of familial amyloidosis, systemic and cerebral amyloidosis is related to the protein gesolin . Two of the most carefully documented forms of hereditary CAA are those related to the British and Danish forms of familial dementia . Mutations in the BRI2 gene are associated with deposition of ABri and ADan amyloids in brain and spinal cord and as CAA . BRI2 mRNA and BRI2 protein are widely expressed by neurons and glia but are not expressed by cerebrovascular smooth muscle cells , suggesting that the amyloid in the vessel walls is derived from the brain rather than produced locally by smooth muscle cells in the artery walls. Prion proteins (PrPs) are deposited mainly in brain parenchyma in human and animal prion disorders such as Creutzfeldt-Jacob disease, scrapie and bovine spongiform encephalopathy . However, PrP CAA has been reported in familial and sporadic human disease  and in certain types of scrapie in which there is a truncated form of PrP , suggesting that PrP may normally drain from the brain along perivascular pathways. In this review, we concentrate on Aβ-CAA as it is the commonest type of CAA and has a very significant association with intracerebral haemorrhage and dementia in the older population . In particular, we focus on the pathology, pathogenesis and complications of CAA, its relationship to the aetiology of AD and how it affects the clinical outcome of immunotherapy for AD. Many of the general principles that have emerged from the study of Aβ-CAA can be applied to the other, less common, types of CAA . As Aβ acts as a natural tracer for the drainage of solutes from the human brain, CAA has been a useful model for establishing lymphatic drainage pathways of the human brain and their significance for neuroimmunology [7, 17]. The first detailed descriptions of CAA are attributed to Scholz , who described the deposition of proteinaceous material within cerebral artery and capillary walls and as excrescences or Drusen on the outer aspects of vessels in the brain (drusige Entartung). In the 1980s, it was from leptomeningeal arteries with CAA that Glenner and colleagues  first isolated and characterised Aβ. The distribution of CAA in the different regions of the brain corresponds to the distribution of plaques of Aβ [20–22]. In AD, plaques and CAA both appear to follow a sequence involving the cerebral isocortex (neocortex) at the earliest stages, then the allocortex of the hippocampus and related structures, followed by involvement of the basal ganglia and thalamus [20–22]. The structures of the walls of arteries in the neocortex and basal ganglia differ  and this may partly account for the less frequent deposition of Aβ as plaques and CAA in the basal ganglia [20, 22, 23]. The shorter and more soluble Aβ40 is most abundant in CAA, whereas the longer and less soluble Aβ42 predominates in Aβ plaques within brain parenchyma . Apolipoprotein E (ApoE) co-localises with Aβ, both in plaques in the brain and with Aβ in the walls of capillaries and arteries in CAA [22, 23]. Together with age, APOE ε4 genotype is a major risk factor for both CAA and AD . Leptomeningeal arteries on the surface of the cerebral hemispheres are most commonly affected by CAA, arteries in the cerebral cortex are less affected, and capillaries are even less frequently involved by CAA. Medium-sized leptomeningeal arteries often have a patchy deposition of Aβ in the media or in the adventitia on the outer aspects of the artery wall (Figure 1a) . Small arteries may show dense accumulation of Aβ in the tunica media (Figure 1a), or as seen in an artery entering the cerebral cortex in Figure 1b, there may be a reticular pattern of Aβ deposition that reflects the accumulation of Aβ in the basement membranes of the smooth muscle cells in the tunica media [4, 5, 24]. Cerebral amyloid angiopathy in Alzheimer disease. (a) Small leptomeningeal arteries (SLAs) on the surface of the cerebral cortex show dense deposits of amyloid-beta (Aβ) in their walls, whereas the medium-sized arteries (MLAs) show a more dispersed pattern of deposition of Aβ. A cortical artery with cerebral amyloid angiopathy (CxA) is surrounded by plaques of Aβ in the brain parenchyma (pan-Aβ immunohistochemistry). (b) Branch of a leptomeningeal artery entering the cerebral cortex. Amyloid (red) is in the basement membranes (as outlined by collagen IV staining ) surrounding smooth muscle cells  (dark spaces) in the tunica media (confocal microscopy of Congo red stained preparation). Scale bars = 100 μm (a) and 50 μm (b). Aβ is detectable by thioflavin staining or by immunohistochemistry mainly in the walls of leptomeningeal arteries with a diameter of less than 60 μm , but this reveals only part of the picture. Biochemical investigations have detected Aβ in intracranial vessels as large as the basilar and middle cerebral arteries in individuals as young as 20 years of age (the youngest tested) and increasing sharply in those from 50 to 70 years of age . Aβ was undetectable in the walls of extracranial blood vessels . In transgenic mouse models of Aβ-CAA, there is heavy deposition of Aβ in the walls of leptomeningeal arteries, but involvement may start with the larger arteries at the base of the brain . Veins do not appear to be involved in CAA, although deposits of Aβ are found attached to the walls of veins when CAA of leptomeningeal arteries is severe; this may be due to flakes of amyloid detaching from artery walls in the subarachnoid space and attaching to veins . Aβ may be deposited in the whole or part of the circumference of the wall of cortical arteries (Figure 2a). When arteries are viewed in a longitudinal plane, however, deposition of amyloid is often discontinuous along the length of the vessel (Figure 2b). Transverse bands (Figure 2c) reflect the deposition of amyloid in basement membranes surrounding smooth muscle cells in the tunica media . A similar patchy distribution is seen in the walls of leptomeningeal arteries [4, 27]. The discontinuous nature of the amyloid deposits in CAA means that estimating the true incidence and severity of CAA is probably most accurately performed on isolated cerebral vessels rather than on sections of brain . Cerebral amyloid angiopathy: amyloid-beta (Aβ) in cortical and leptomeningeal artery walls. (a) Cortical artery with deposition of Aβ in its wall but with no Aβ in the glia limitans (pan-Aβ immunohistochemistry). Smear preparations of cortical arteries showing (b) a patchy transverse banding pattern of amyloid deposition with no amyloid deposits attached to the outer aspect of the artery and (c) transverse banding of amyloid associated with the basement membranes of smooth muscle cells [4, 5] (thioflavin S stain: confocal images). 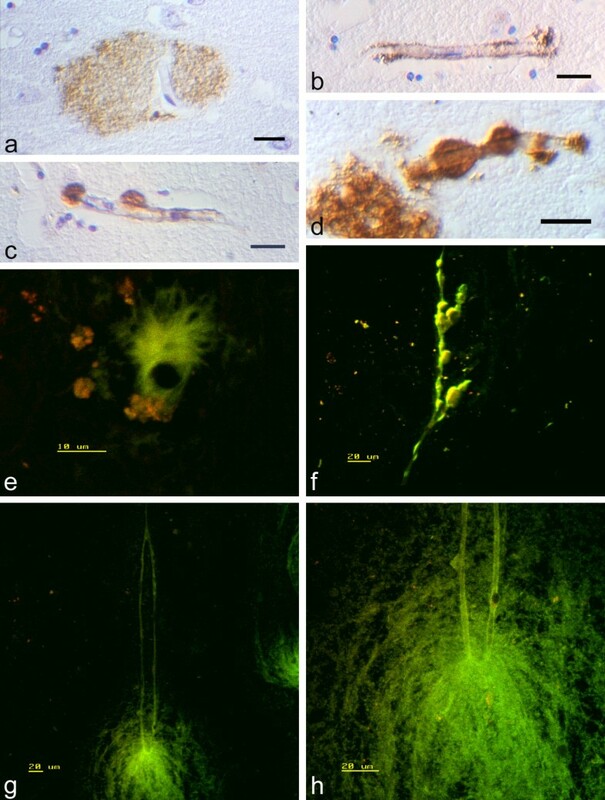 Pan-Aβ immunohistochemistry of cortical arteries showing (d) Aβ in the glia limitans but with no Aβ in the vessel wall, (e) deposits of Aβ in the artery wall and in the glia limitans but no continuity between the two Aβ deposits and (f) Aβ in an artery wall with a heavy deposit of Aβ in the glia limitans both surrounding the vessel and on the surface of the brain (top). There is no continuity between the staining in the vessel wall and the glia limitans. A cored amyloid plaque in the brain parenchyma is seen to the left of the artery. Leptomeningeal arteries showing (g) deposition of Aβ in the vessel walls (pan-Aβ immunohistochemistry) and (h) loss of alpha-smooth muscle actin staining in the artery walls in relation to the deposition of Aβ; arteries in (h) are the same as those in (g). (Immunohistochemistry for alpha-smooth muscle actin.) Scale bars = 20 μm (a-e, g, h) and 50 μm (f). Reprinted with permission from John Wiley & Sons, Inc. .
Aβ is frequently deposited in the glia limitans that surrounds arteries in the cortex. However, it is unlikely that Aβ drains directly from the glia limitans into the artery wall  as the adjacent artery wall may lack Aβ (Figure 2d), and in the less severely involved vessels, there is discontinuity across the artefactual space  that separates Aβ in the artery wall from deposits in the glia limitans (Figure 2d-f). ApoE is also deposited in the glia limitans and co-localises with the Aβ . The ligand in the glia limitans to which the Aβ binds is not known and it may be that Aβ is taken up by astrocytes . Dystrophic neurites are also seen in the perivascular glia limitans, although again the reason is not clear . At the surface of the cerebral cortex, deposition of Aβ may be seen in the glia limitans remote from artery walls  (Figure 2f), which suggests that the deposits are due to an inherent property of the glia limitans rather than related to perivascular drainage of Aβ. Deposition of Aβ in basement membranes in artery walls appears to impair the perivascular drainage of ISF and solutes from the brain [3, 5], but it has other effects. 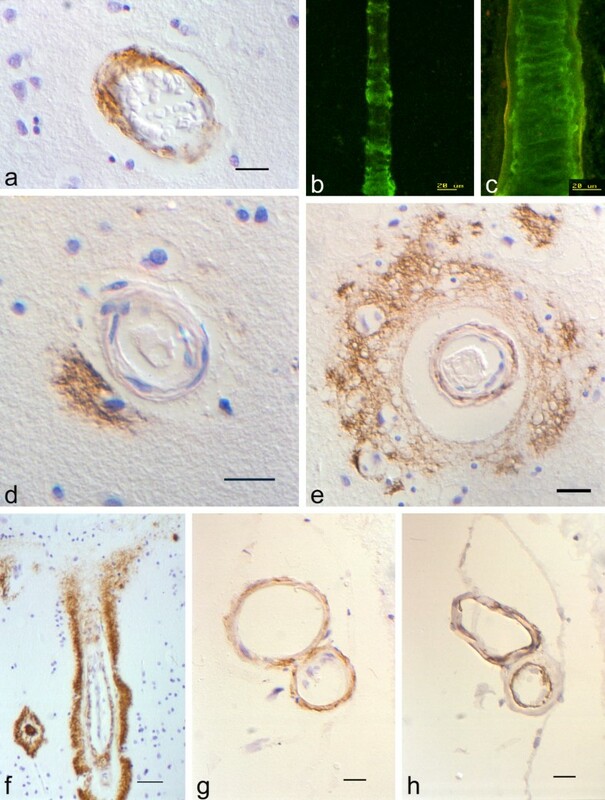 Smooth muscle cells are lost from artery walls in CAA and replaced by amyloid (Figure 2g, h), and the affected vessels may show severe degenerative changes that are associated with cerebral haemorrhage . Deposits of Aβ in capillary walls are much less common than Aβ deposits in the walls of cortical and leptomeningeal arteries . Capillary CAA is seen mostly in areas that are devoid of Aβ plaques [31, 32], and the Aβ in the capillary walls is mainly Aβ42 . Capillaries with no Aβ in their walls may be closely associated with diffuse plaques of Aβ (Figure 3a). In CAA, insoluble Aβ is deposited in the basement membranes of capillary endothelia (Figure 3b-d) and as excrescences or Drusen (Figure 3c-h) that are smooth and globular (Figure 3c, d, f), irregular (Figure 3e) or filamentous (Figure 3g, h). Drusen are continuous with Aβ in the capillary basement membrane. Both types of pericapillary deposit of Aβ can be demonstrated in paraffin sections (Figure 3c-e), in smear preparations of brain  (Figure 3f-h) or on vessels isolated by digesting away the surrounding brain tissue . The consolidated globular Drusen (Figure 3c, d, f) may be older than the filamentous deposits of Aβ where the strands of amyloid are in the extracellular spaces of the brain parenchyma through which solutes diffuse to reach the drainage pathways in the capillary walls [3, 33]. Capillary amyloid angiopathy. Pan-amyloid-beta (pan-Aβ) immunohistochemistry. (a) A diffuse plaque of Aβ in cerebral cortex with a capillary, devoid of Aβ, running through it. Cortical capillaries are surrounded by (b) a thin layer of Aβ corresponding to the perivascular basement membrane (c) with attached globular deposits of Aβ (Drusen) continuous with Aβ in the capillary wall. (d) Globular Aβ Drusen partly surround the capillary wall. Confocal images were stained with thioflavin S. (e) Histological section of a cortical capillary with a spiky Druse of amyloid continuous with amyloid in the capillary wall. (f) Smear preparations of multiple globular Drusen and (g) filiform deposits of amyloid attached to cortical capillaries whose walls also stain for amyloid. (h) Higher magnification shows continuity of the filaments with amyloid in the capillary wall. Scale bars = 20 μm (a-d, f-h) and 10 μm (e). Reprinted with permission from John Wiley & Sons, Inc. . Early theories for the pathogenesis of CAA suggested that the Aβ in vessel walls was derived from the blood [18, 19] or from vascular smooth muscle cells . However, transgenic mouse lines that overexpress human Aβ only in neurons in the brain develop CAA , suggesting that Aβ is probably not derived from the blood in CAA but from the brain . Furthermore, Aβ is deposited not only in the walls of arteries in CAA but also in the walls of capillaries that lack smooth muscle [34, 35]. Although smooth muscle cells in artery walls produce Aβ (in common with most cells in the body) and may contribute to CAA, they do not appear to be the main source of Aβ in CAA [5, 36]. In BRI2-related dementia , ABri amyloid is not produced by vascular smooth muscle cells, yet CAA is a very prominent pathological feature; this again suggests that amyloid in CAA is derived from the central nervous system. Most of the evidence now points to the failure of perivascular lymphatic drainage of Aβ as a major factor in the pathogenesis of CAA in AD [5, 23]. Perivascular lymphatic drainage pathways by which ISF and solutes drain from the brain have been defined in experimental animals [3, 9, 37], and Aβ is deposited in those pathways in CAA as its drainage fails with age (Figure 4). Fluorescent tracers injected into the striatum of the mouse brain initially spread diffusely through the brain parenchyma, but within 5 minutes, the tracers are located in the capillary basement membranes and in the basement membranes around smooth muscle cells in the tunica media of arteries . Tracers are taken up in small amounts by vascular smooth muscle cells and by perivascular macrophages along the lymphatic drainage route . Lymphatic drainage of ISF along artery walls appears to be almost completely separate from CSF . Only 15% of radioactive tracer injected into the ISF is recoverable from the CSF, and the majority of tracer drains to the cervical lymph nodes  at a rate equivalent to lymphatic drainage from other tissues . Radioactive tracers injected into the brain were located in the adventitia of intracranial arteries but were absent from the walls of the carotid artery in the neck . This suggests that solutes draining from the brain pass along the walls of intracranial arteries but leave the carotid artery wall at the base of the skull en route to the cervical lymph nodes [7, 9]. Elimination of amyloid-beta (Aβ) from the brain. Aβ is (i) produced by neurons and other cells in the brain and then (ii) diffuses with interstitial fluid and other solutes through the narrow extracellular spaces (ECS) of the brain to (iii) the bulk flow lymphatic drainage pathways in the basement membranes of capillaries and in the tunica media of artery walls and (iv) out of the brain to cervical lymph nodes. Smooth muscle cells and perivascular macrophages take up Aβ and are part of the elimination pathway. Degradation of Aβ occurs in the brain parenchyma, by neprilysin and other enzymes, and Aβ is absorbed into the blood by LRP-1 (lipoprotein receptor-related protein-1)-mediated mechanisms in capillary endothelia. These mechanisms for the elimination of Aβ from the brain tend to fail with age and in Alzheimer disease. Figure 4 summarises the major mechanisms and routes for the elimination of Aβ from the brain. Observations from tracer studies and from CAA (Figures 1, 2, 3) suggest that, as Aβ leaves the brain, it initially diffuses with ISF and other solutes through the narrow and tortuous extracellular spaces of the grey matter [3, 33, 38] (Figure 4). It then enters the bulk drainage pathways in the 100- to 150-nm-thick endothelial basement membranes in the walls of capillaries [3, 28, 33] to drain out of the brain along basement membranes in the tunica media of cortical and leptomeningeal arteries . Basement membranes of the arterial endothelium are not involved in the drainage of fluorescent tracers and do not contain stainable Aβ in CAA [3, 5] (Figure 4). This may be one reason why CAA in older patients and in those with AD is not accompanied by catastrophic arterial thrombosis. Although capillaries may be occluded and reduced in number in AD , thrombotic occlusion of arteries in AD is not as widespread as CAA. Tracer studies suggest that fluid and solutes move to the adventitia of leptomeningeal arteries and from there to the lymph nodes at the base of the skull [7, 9]. In CAA, Aβ is detected by immunohistochemistry mainly in the tunica media of smaller leptomeningeal arteries but is present in the adventitia on the outer aspects of medium-sized leptomeningeal arteries , suggesting that Aβ follows the same lymphatic drainage route as tracers in experimental animals [7, 9]. Restriction of Aβ to the walls of intracranial arteries and its absence from the walls of the extracranial carotid artery  suggest that Aβ drains from the wall of the carotid artery to lymph nodes related to the artery at the base of the skull . The pattern of deposition of Aβ in the basement membranes of capillary and artery walls in CAA indicates that there is a failure of lymphatic drainage of Aβ and suggests that the failure is related to age changes in artery walls. As arteries age, fibrous tissue increases in the tunica intima and tunica media (arteriosclerosis and arteriolosclerosis) and arteries become stiffer . Such age changes may interfere with the motive force for transport of ISF and solutes, like soluble Aβ, out of the brain. Theoretical models suggest that the contrary (reflection) wave that follows the pulse wave in arteries is the motive force that drives ISF and solutes out of the brain along perivascular pathways in the direction opposite to the flow of blood in the lumen . Stretching of the basement membrane with expansion of the artery during systole may be the valve that prevents reflux during the subsequent pulse wave . If the pulse wave is the motive force for perivascular drainage of Aβ, then stiffening of artery walls with age may interfere with that force. Vascular basement membrane changes that occur with age and defects in innervation of cerebral vessel may also play roles in the pathogenesis of CAA [8, 23]. Overproduction of transforming growth factor-beta-1 in transgenic mice results in changes in vascular basement membranes and induces CAA . Furthermore, experimental cholinergic deafferentation of arteries within the brain, induced by the destruction of the nucleus basalis, results in CAA that resolves with re-innervation . These observations emphasise the need to view the lymphatic drainage pathways as a dynamic entity in the context of the whole neurovascular unit . Capillary CAA is much less common than CAA in leptomeningeal or cortical arteries and has been associated with severe dementia  and with APOE ε4 genotype . However, this does not explain the pathogenesis of capillary CAA. An association between capillary CAA and thrombotic occlusion of cortical arteries has been reported , and there is an increase in capillary CAA in the brains of patients treated with immunotherapy . In both of these instances, capillary CAA is associated with a paucity or absence of Aβ plaques in the surrounding brain parenchyma and the deposition of Aβ in capillary walls. In the immunised patients with AD, there is an increase in Aβ42 in the walls of blood vessels, suggesting that it is derived from plaque Aβ . It seems that the removal of Aβ from plaques by microglia, activated by either ischaemia or immunisation, results in an overload of the drainage pathways in capillary walls by which Aβ drains from the brain. Arranged along the pathway for the drainage of soluble Aβ from the brain is an array of enzymes and mechanisms for the elimination of Aβ (Figure 4) . Enzymes that degrade Aβ are present in the brain parenchyma and in artery walls . 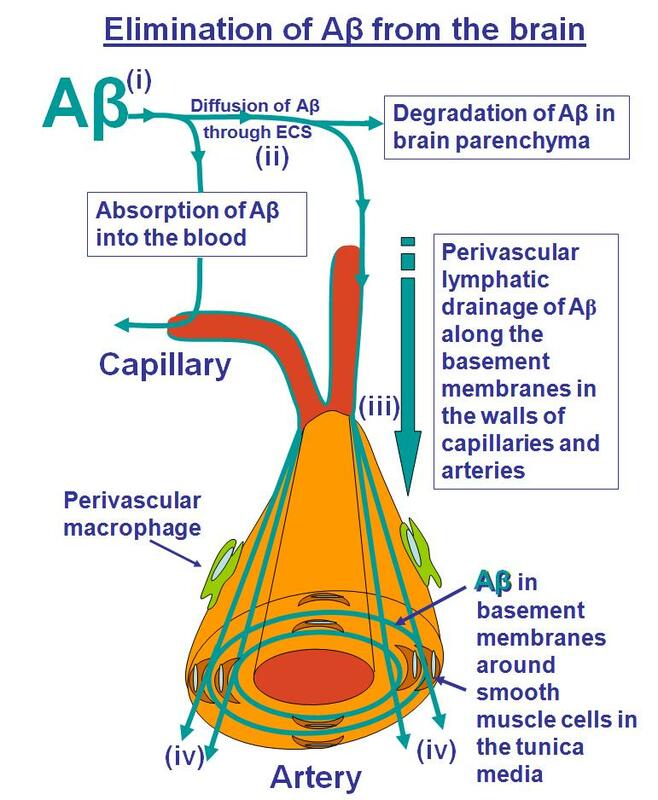 Mechanisms that mediate absorption of Aβ into the blood via capillary endothelium or uptake of Aβ by smooth muscle cells are also present in the walls of cerebral blood vessels . Neprilysin, angiotensin-converting enzyme and insulin-degrading enzyme are among the Aβ-degrading enzymes to which Aβ is exposed as it diffuses through the extracellular spaces of grey matter in the brain and along the perivascular drainage pathways . Neprilysin can hydrolyse monomeric and oligomeric forms of Aβ40 and Aβ42. However, abnormal forms of Aβ that result from the Flemish, Dutch, Italian and Arctic mutations in the APP gene are not cleaved by neprilysin and these familial disorders are associated with severe CAA and early-onset cerebral haemorrhage or dementia . Neprilysin is produced by pyramidal neurons and by smooth muscle cells in the walls of arteries ; a reduction of neprilysin in artery walls is associated with severe CAA in AD and in transgenic mice [47, 48]. Other enzymes that degrade Aβ in the walls of cerebral arteries are also deficient or less active in AD . Absorption of Aβ into the blood, mediated by low-density lipoprotein receptor-related protein-1 (LRP-1) located in capillary endothelium [43, 49], is a major mechanism for elimination of Aβ from the brain  and is six times faster than lymphatic drainage . LRP-1 also mediates the entry of Aβ into vascular smooth muscle cells, where it is degraded . Failure of LRP-1-related elimination of Aβ with age  or in conditions of hypoxia  may also increase the flow of soluble Aβ into perivascular drainage pathways already compromised by age changes in the artery walls themselves . There is evidence that the perivascular macrophages that take up tracer draining along perivascular pathways  also degrade Aβ . In APP transgenic mice that overproduce human Aβ, stimulation of perivascular macrophages reduces the severity of CAA whereas depletion of these cells increases the severity of CAA . Enzymic and absorptive mechanisms appear to fail with age . Such a failure may be a factor that aggravates CAA in older patients and in those with AD by diverting more Aβ into the ageing perivascular drainage pathways . The major complications associated with CAA are (a) rupture of amyloid-laden arteries, resulting in acute and often fatal intracerebral haemorrhage; (b) Aβ-related angiitis; (c) disruption of lymphatic drainage of ISF and solutes along artery walls; and (d) cerebral hypoperfusion. The last two complications apply particularly to AD. Intracerebral haemorrhage is a feature of familial and sporadic CAA . Familial cases of Aβ-CAA typically present with recurrent cerebral haemorrhages, white matter lesions and cognitive impairment 20 years earlier than patients with sporadic CAA . Mutant Aβ in some forms of familial CAA is resistant to degradation by neprilysin and thus may increase the amount of Aβ draining along perivascular pathways . In sporadic CAA-related haemorrhage, the temporal and occipital lobes are preferentially affected , and although the major risk factor for the development of CAA is the APOE ε4 allele, the ε2 allele predisposes to haemorrhage . Artery walls often show severe degenerative changes in addition to severe CAA . Aβ-related angiitis is a complication of CAA [52, 54]. Patients present at a mean age of 67 years with changes in mental status, headaches, seizures, focal neurological signs or hallucinations . The angiopathy may be granulomatous with accumulation of lymphocytes around leptomeningeal arteries and the presence of multinucleated giant cells in vessel walls related to deposits of Aβ. There is microglial activation in the cortex and white matter hyperintensities on magnetic resonance imaging . The presence of angiitis in relation to CAA may have implications for immunotherapy in AD [52, 54]. CAA affects two of the major functions of cerebral arteries in AD: (a) the blood supply to the brain and (b) the lymphatic drainage of ISF and solutes from the brain. Accumulation of Aβ and the loss of smooth muscle cells in CAA result in decreased vascular reactivity to functional stimulation and affect the blood supply to the brain in AD [16, 43, 55]. Pathologically, CAA initially affects the leptomeningeal and parenchymal arteries of the cerebral cortex whereas severe arteriosclerosis tends to affect the vessels in the basal ganglia in the initial stages, and both are associated with defects in blood flow and cognitive decline in AD . Figure 5 summarises the role of impaired lymphatic drainage of the brain and CAA in the accumulation of Aβ in the brain in AD. Diffusion of Aβ through the extracellular spaces of the brain and along the drainage pathways in artery walls [56, 57] is impaired by plaques of Aβ in the brain [58, 59]. CAA also restricts the drainage of Aβ along perivascular pathways as seen in tg2576 transgenic mice in which plasma levels of Aβ fall and levels of Aβ in the brain rise as CAA develops . Impaired lymphatic drainage of the brain in the pathogenesis of cerebral amyloid angiopathy (CAA) and Alzheimer disease (AD). The schema outlines a working hypothesis for the failure of perivascular lymphatic drainage of the brain with age and how such a failure contributes to the pathogenesis of CAA and AD. Aβ, amyloid-beta; ECS, extracellular spaces; ISF, interstitial fluid; NFT, neurofibrillary tangle. There is evidence that the failure of elimination of Aβ and fluid from the brain correlates with CAA in human AD. First, severe CAA correlates with severe dementia . Second, high levels of soluble Aβ40 in brain parenchyma, with up to a threefold increase, distinguish demented patients with AD from non-demented patients, even though the non-demented patients may have high numbers of insoluble Aβ plaques in their brains . Third, accumulation of fluid in cerebral white matter (leukoaraiosis) in AD has been correlated with the severity of CAA , suggesting that Aβ in artery walls may block the perivascular drainage of fluid and solutes from white matter as well as from grey matter. These observations suggest that one of the main pathogenetic roles of insoluble Aβ is to block the elimination of fluid and solutes from the brain. This may result in the accumulation of toxic soluble fibrillar oligomers of Aβ in the brain in AD . But it may equally well result in the accumulation of other soluble metabolites and the loss of homeostasis of the neuronal environment with consequent impairment of neuronal function. The reported prevalence of CAA in histological studies of brains of patients with AD varies from 90% to 96% . However, the true prevalence of CAA in AD may be significantly underestimated in histological and immunohistochemical surveys in which little account may be taken of the long length of the perivascular drainage pathways, the patchy nature of Aβ deposits and the relative insensitivity of immunohistochemistry as a method for detecting Aβ compared with biochemical techniques . Methods using isolated cerebral arteries, stained for amyloid, may give better estimates of the true prevalence and distribution of CAA in AD [4, 27], and a greater understanding of the dynamics and pathophysiology of perivascular drainage should help to resolve any current discrepancies in the role of CAA in the aetiology of AD. In addition to the accumulation of insoluble and soluble Aβs in the brain in AD, hyperphosphorylated tau accumulates as neurofibrillary tangle (NFT) in neurons and as neuropil threads and dystrophic neurites in neuronal processes . Explaining how the accumulation of tau relates to the deposition of Aβ in the brain has presented a challenge for many years. In transgenic mice that overexpress both APP and tau, the deposition of Aβ in the brain precedes and accelerates the accumulation of intracellular tau . Furthermore, a recent study suggests that failure of elimination of tau from the extracellular spaces of the brain may play a role in the intracellular accumulation of tau . In AD, tau inclusions first appear in neurons in the transentorhinal cortex and then spread to the hippocampal formation and neocortex . Cognitive impairment ensues as tau inclusions reach the hippocampus, and neocortical tau inclusions are a hallmark of the later and more severe stages of AD . Injections of fibrillary tau transfer the propensity to form NFT in mice , which suggests that interference with the disposal of tau from the extracellular spaces when lymphatic drainage pathways are blocked by CAA may be a factor in the formation and spread of NFT in the human brain in AD. Immunisation against Aβ42 prevents the accumulation of plaques of Aβ in the brains of young transgenic APP mice and removes insoluble plaques of Aβ from the brains of older mice . Similar results with the clearance of Aβ have been observed in the Elan clinical trial of Aβ immunisation in patients with AD . However, despite the removal of Aβ plaques from the brain, there is little evidence that this benefits cognitive function . Figure 6 is a summary of the effects of Aβ42 immunisation on the brain in AD. In non-immunised patients with AD (Figure 6a), insoluble Aβ is present in the brain parenchyma as diffuse plaques and as compact neuritic plaques surrounded by dystrophic neurites containing hyperphosphorylated tau. Neuropil threads and neurons containing NFT are also present in the brains of unimmunised patients. 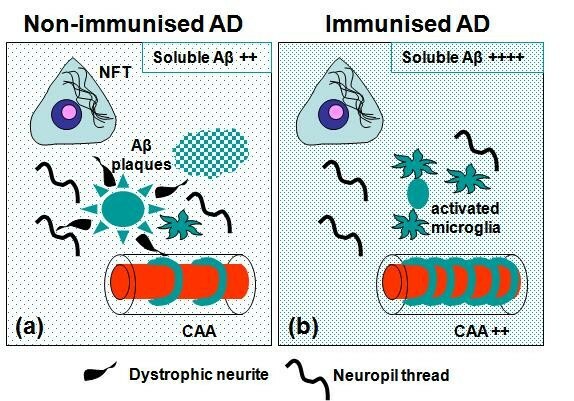 Following immunisation with Aβ42 (Figure 6b), insoluble Aβ in the plaques is removed by antibodies and activated microglia and the dystrophic neurites associated with neuritic plaques disappear . NFTs in neurons and neuropil threads remain . However, the severity of CAA increases following immunotherapy (Figure 6b) [46, 70], and there is some indication that the level of soluble Aβ rises in the brains of treated patients . Changes in the brain induced by amyloid-beta (Aβ) immunotherapy. Comparison of frames (a) and (b) shows the major effects of Aβ immunotherapy upon the brain. There is a decrease in plaques of Aβ and of dystrophic neurites but an increase in the severity of cerebral amyloid angiopathy (CAA), in microglial activation (for the degradation of Aβ plaques), and in the level of soluble Aβ in the brain parenchyma. Neurofibrillary tangles (NFTs) and neuropil threads are still present. AD, Alzheimer disease. There is an increase in Aβ42 in capillary and artery walls following immunisation in AD [45, 46]. Aβ40 is usually the predominant amyloid in vessel walls and Aβ42 is mainly in the plaques . Increased amounts of Aβ42 in vessel walls appear to be the result of removal of the Aβ plaques [45, 46], allowing more Aβ42 to reach drainage channels in capillary and artery walls, where its further removal is blocked and the severity of CAA increases . Changes in the white matter of patients treated with immunotherapy have raised concerns [68, 72]. The increased signal seen in the white matter on T2-weighted magnetic resonance imaging in many older individuals and in those with AD  and often ascribed to ischaemia is aggravated by immunotherapy . Failure of fluid drainage from the white matter along arteries that are severely affected by CAA  may be a factor in the increased white matter changes following immunisation. Solving the problem of CAA is obviously a priority for ensuring the success of immunotherapy for AD and there is some indication that this may be possible. Although Aβ immunotherapy in APP mice usually results in an increase in CAA , passive immunisation with antibodies that bind to the N-terminal portion of Aβ results in a reduction of CAA . Furthermore, two human cases who survived for 5 years following immunisation showed extensive clearance of Aβ from plaques and very little CAA . It is possible that, with time, CAA will resolve in some immunised patients. The role of apoE in the elimination of Aβ from the brain is still not fully established, but the marked accumulation of apoE co-localising with Aβ in CAA following immunisation suggests that the elimination of Aβ may be chaperoned by apoE . Elimination of Aβ from the brain involves enzymic degradation, its absorption into the blood and drainage of Aβ along perivascular lymphatic drainage pathways. All of these mechanisms appear to fail as the brain and cerebral arteries age. One of the major consequences of this failure is the obstruction of lymphatic drainage of fluid and solutes from the brain by CAA that results in the accumulation of insoluble and soluble Aβs in the brain and probably other metabolites that would lead to loss of homeostasis of the neuronal environment. Accumulation of hyperphosphorylated tau in neurons and failure of neuronal function may ensue from the loss of homeostasis. The therapeutic challenge is to ensure adequate elimination of Aβ from the ageing brain and along ageing cerebral arteries. Pharmacological intervention to enhance enzymic degradation of Aβ and absorption of Aβ into the blood is one obvious direction to take. Resolving the inadequacies of the ageing lymphatic drainage pathway will entail a greater understanding of its physiology and how the various elements such as basement membranes, smooth muscle cells and perivascular cells interact and how they change with age. 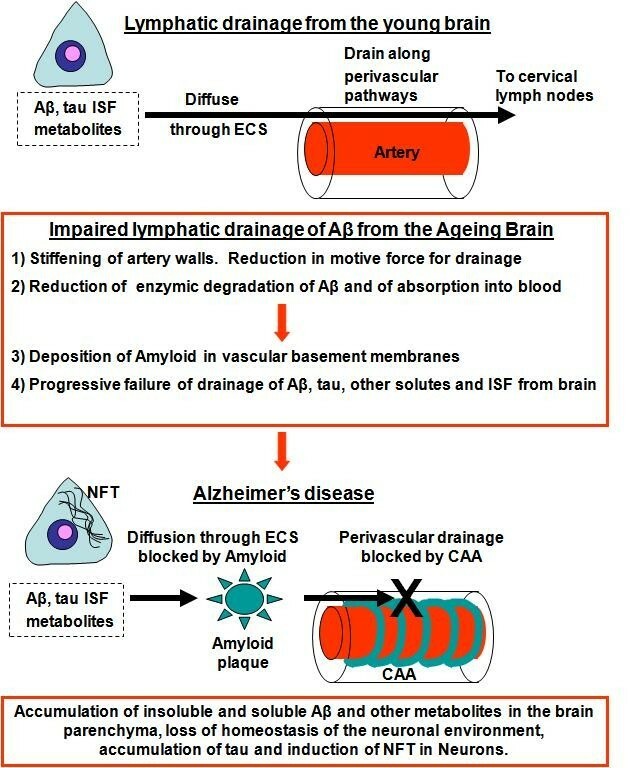 Establishing the role played by apoE in the elimination of Aβ and harnessing this information for the design of therapies may help to prevent the accumulation of amyloid in blood vessel walls and brain in AD. We thank Anton Page of the Biomedical Imaging Unit, Southampton General Hospital, for his help with the illustrations and Delphin Boche (Clinical Neurosciences, Southampton) for her advice on the manuscript. This work was supported by the Alzheimer's Research Trust (UK).